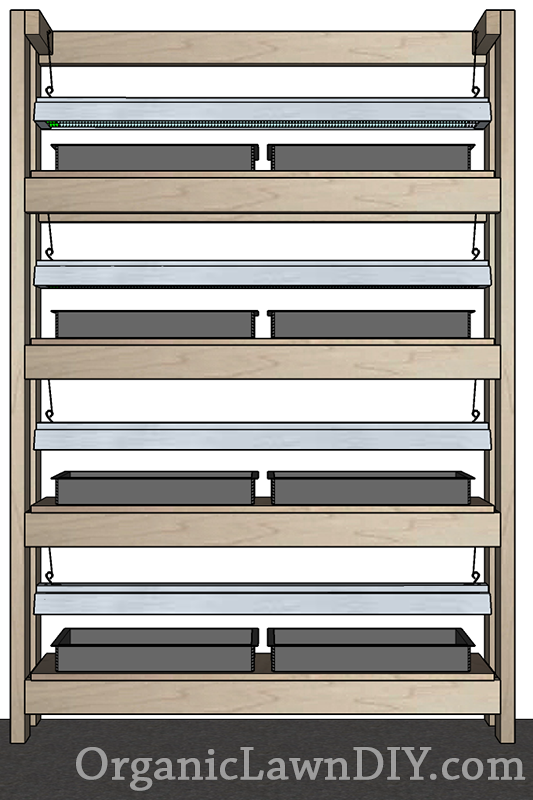 These woodworking plans are to build narrow seed starting shelves that will hold 8 trays but conserve space. They'll even fit on the side wall of most standard sized single car garages without getting in the way. Instead of building the shelves as a single unit and then mounting it to the wall we're going to build the shelves directly on the wall. This will make it easier to secure everything properly and keep the shelves level. 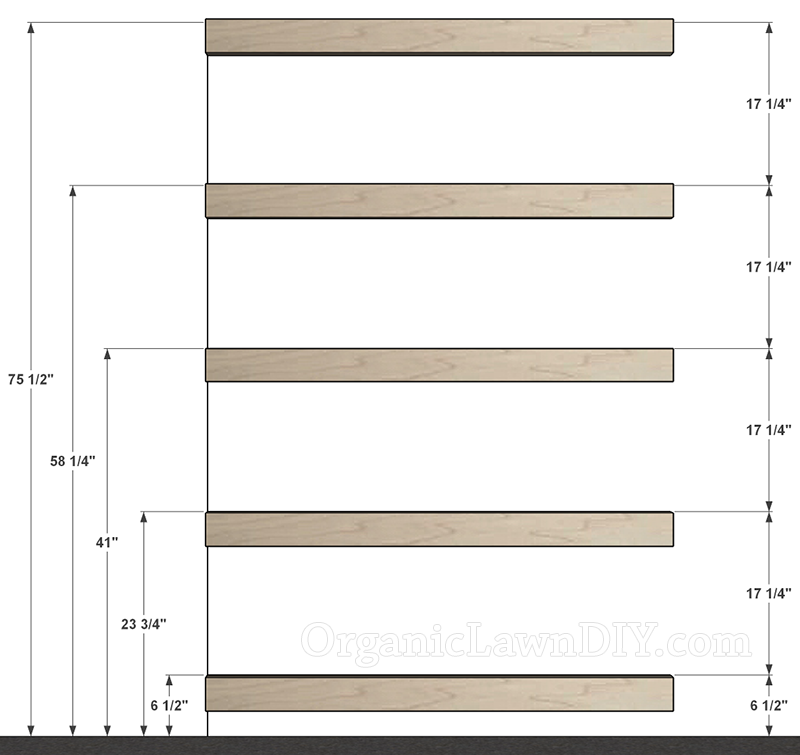 Start by drawing a 75-1/2" long vertical line using a level to keep it plumb. 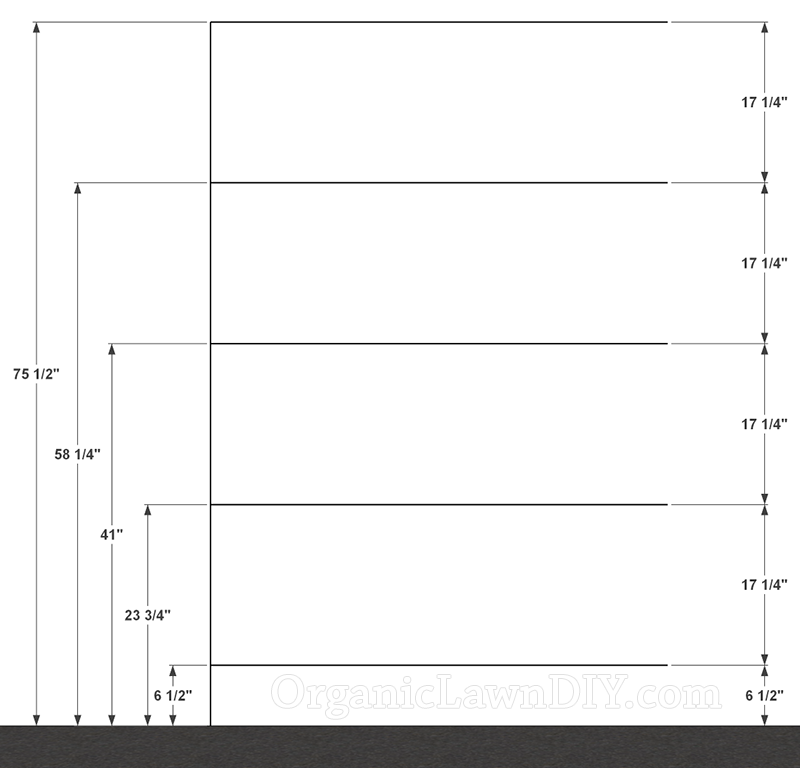 This line should be located 1-1/2" to the right of where you want the left side of your shelves to start. Next draw horizontal layout lines where the shelves would go. Use a long level as your straight edge to make sure the lines are level. The first line will be 6-1/2" up from the floor. The 4 other lines will each be 17-1/4" up from the previous line. 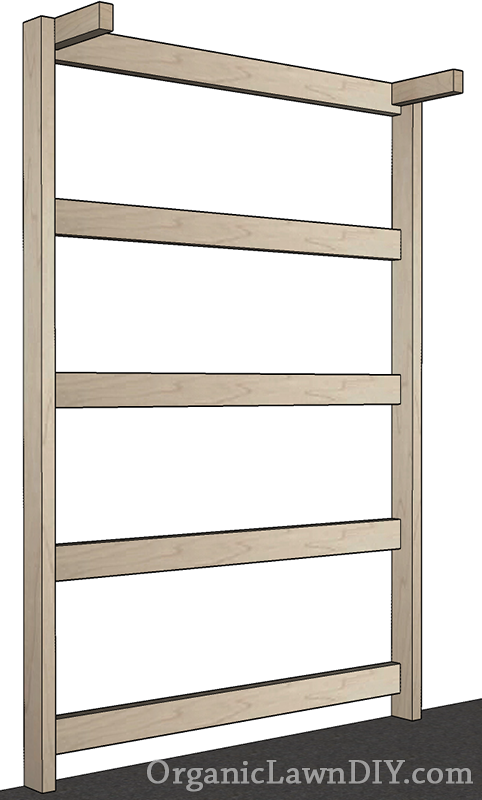 Now attach the 5 49" long 2x4 back shelf supports to the wall so that the top of the 2x4 is at the line. 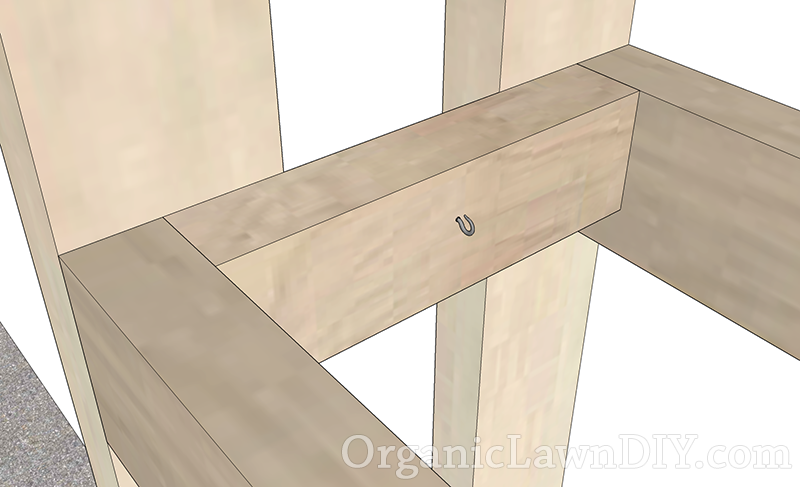 Use 2 2-1/2" long wood screws into each stud location. Now screw 2 of the 75-1/2" long 2x4 Side Posts to the shelf supports on the wall. 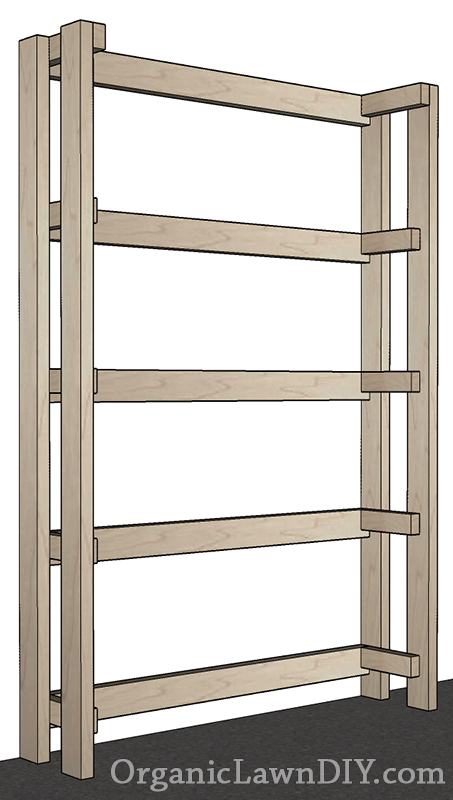 Use 2 2-1/2" long wood screws into each shelf support. If you left them a little long, confirm the measurement and make the cuts to allow for any unevenness in the floor. The 2 10" long 2x3 boards will now be secured to the top. 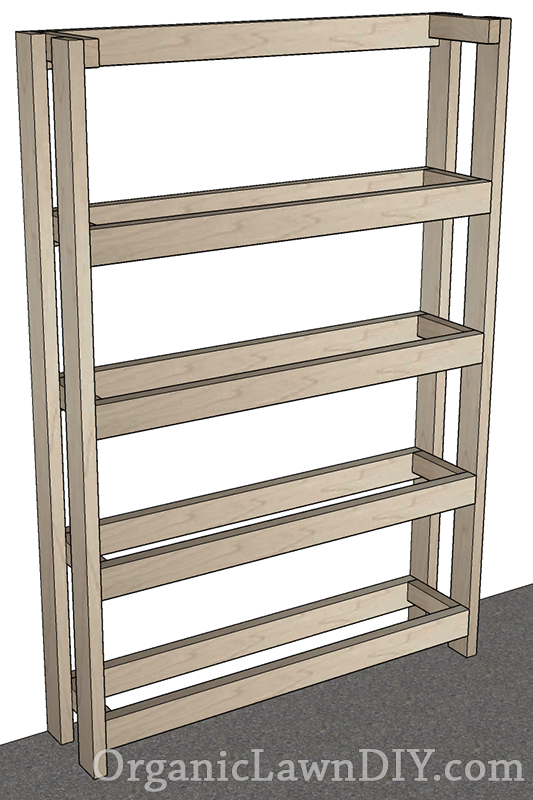 The top of the 2x3 needs to be flush with the top of the top shelf support on the wall. Use a level to make sure each 2x3 is level and secure it to vertical 2x4 side post using 2 2-1/2" wood screws in each 2x3. Against each of the top side supports you installed in the previous step, place a 2x4 up against the front and make sure it's plumb. Mark the top of the 2x4 where it meets the top of the 2x3 top side support and cut it to length. 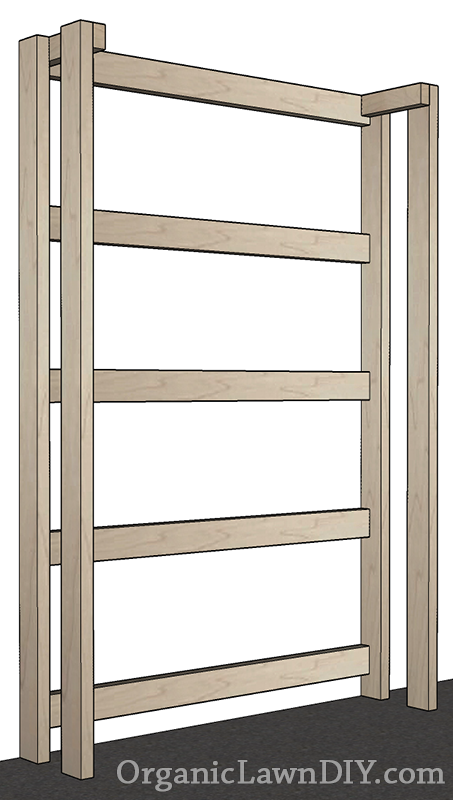 Attach to the top side supports using 2 2-1/2" wood screws in each top side support. Use a level to make sure it's plumb when you screw it. The 8 remaining 2x3 side supports are 8-1/2" long. Screw them to the side supports using 2 2-1/2" wood screws at each end. Make sure they're level with the top of the back shelf support and that the front side supports remain plumb as you work. The screw hooks are used to hold the chains for the grow lights. Drill a pilot hole and screw in a screw hook at the center of the top 4 side supports about 1" down from the top of the 2x3. Measure from the wall to the front of the front side supports so that it is directly in the center. The bottom set of 2x3's don't need hooks. It's easier to do this now before you assemble the rest of the shelve parts. The 49" long 2x4 front shelf supports go on next. If everything was done correctly up to this point this will be level if they're aligned with the side shelf supports but double check to be on the safe side. 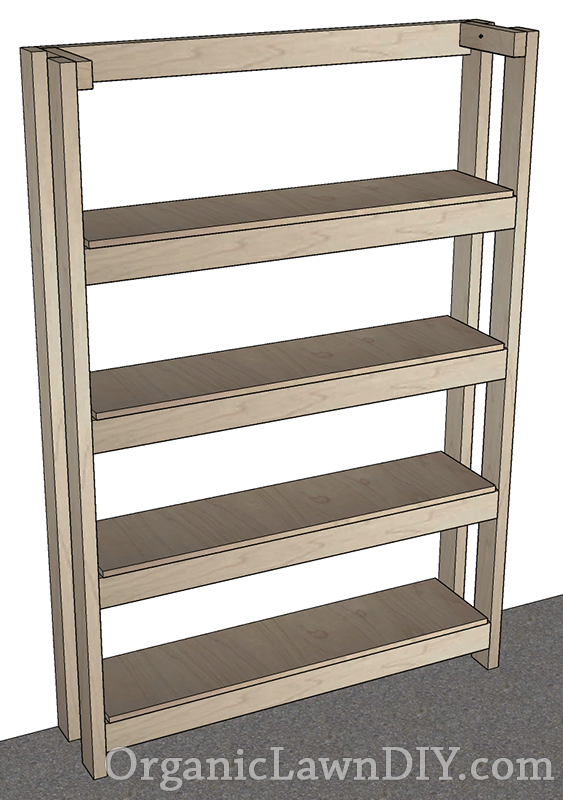 Use 3 2-1/4" wood screws to attach each end of the front shelf supports. 2 into the vertical front 2x4 and 1 from the front into the side shelf support. 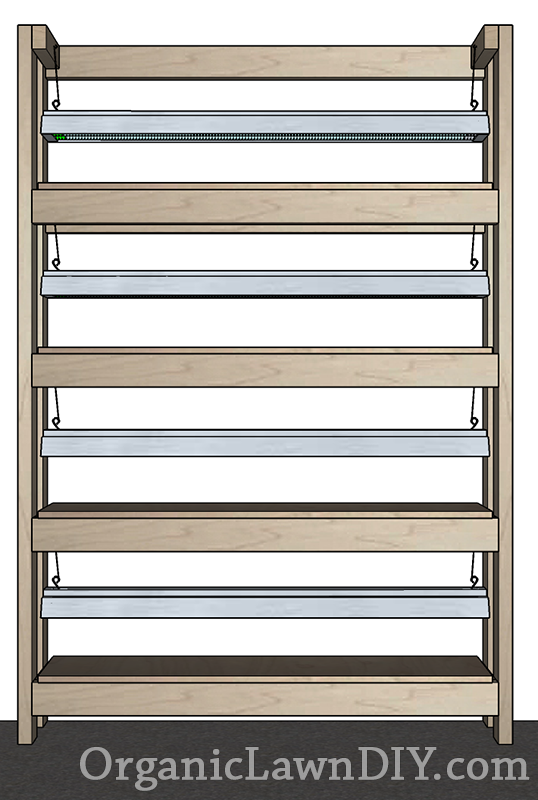 The space for the shelves is 49" long but the actual shelf width is 48" (maybe even 47-3/4" depending on if you get plywood or OSB). When installing the shelves leave an even gap on each side of the shelf. It's not critical that it be exactly the same as long as there is a good amount of the shelf resting on the side supports. 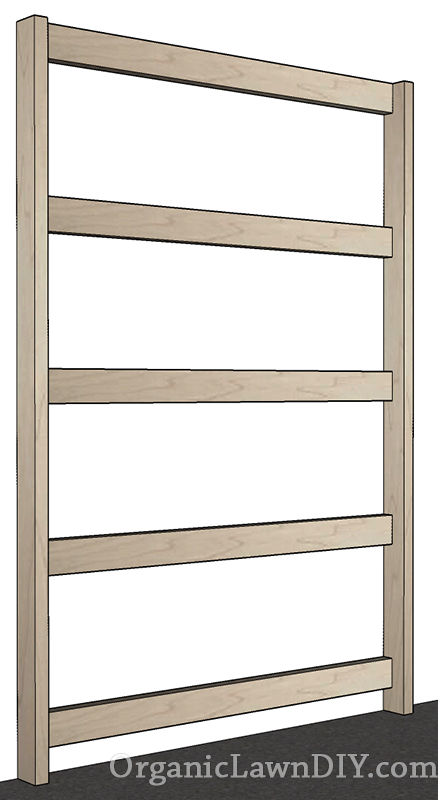 You can use 1-1/2" wood screws or finish nails spaced about every 8" around the perimeter to keep the shelves in place. Hang the shop lights from the screw hooks using their chains. 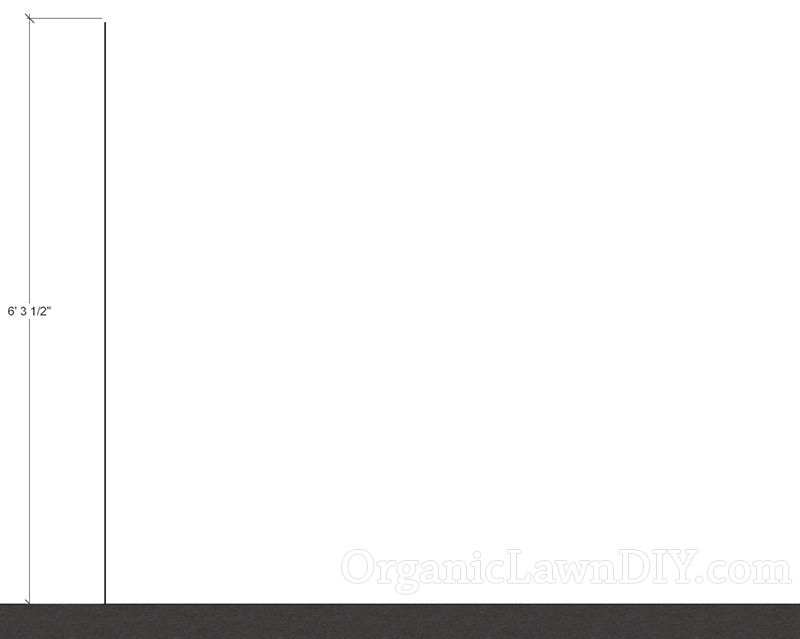 You can adjust the height of the light as the seedlings grow by repositioning the chain on the hook. Mount a power strip on the side of the shelf to plug your lights into. You're done. Time to get planting! You can fit 2 1020 trays on each shelf.